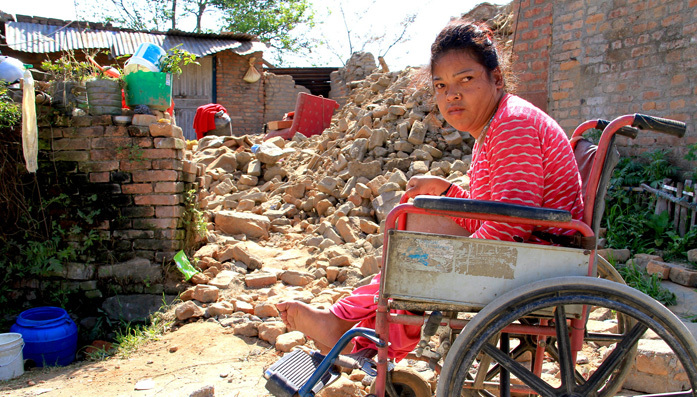 When disasters strike, people with disabilities are often the worst affected and the last to receive help. They may miss out on warnings or information because they can’t see, hear or understand them. They may be unable to escape quickly from danger. And vital emergency aid like shelters or food distribution may be too far away, or difficult to access. could provide emergency relief backpacks for five people, designed to be easier for people with physical disabilities to carry, packed with essential supplies like food and hygiene products. could provide six chickens to a family, a source of food and income. could provide a large, sturdy tent, providing shelter for families who have lost their homes. CBM has over 100 years’ experience of providing relief and recovery during conflicts and natural disasters. We ensure people with disabilities can access emergency relief and rehabilitation immediately. We train and support other humanitarian organisations, helping ensure that the support they deliver reaches people with disabilities. We remain in the affected area to support, plan and develop long-term programmes to help rebuild lives and communities into the future. After the Nepal earthquake struck on 25th April 2015, Purna Maya's father found her unconscious in the ruins of their collapsed house. The 36 year old has cerebral palsy and uses a wheelchair. For a week, she and her father lived in the open, battling cold nights and occasional rains, until help arrived from one of CBM's partners who provided emergency shelter for Purna Maya and her father.